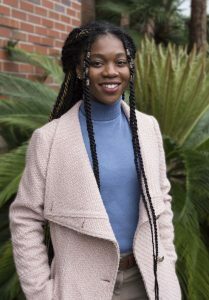 Nuclear Engineering Ph.D. student Charlyne Smith has been awarded a coveted National Science Foundation Graduate Research Fellowship. She is a 2017 graduate of Coppin State University, where she earned her bachelor’s degree in chemistry and mathematics, and is a first year Ph.D. student in the University of Florida’s Department of Materials Science and Engineering. Charlyne was inspired by her childhood in Jamaica to study nuclear energy. Find out more about Charlyne and her research in this Q&A. How did you become passionate about nuclear engineering? Growing up in St. Catherine, Jamaica, we had limited resources – water, power, shelter. I could have chosen to study any of those, but I was most interested in energy. I grew up with electricity issues, and I want future generations of children to grow up there without knowing what that is like. I originally wanted to study solar energy, but I found that the technological advances were slow in solar. I started investigating nuclear engineering and discovered the field had a lot of potential for improving energy production more immediately. What research project will the NSF Fellowship be funding? Why is Uranium-Molybdenum and its microstructure important? I believe it is a prime candidate to lead the global collaborative nonproliferation effort. It is a natural, low-enriched uranium that could be used in reactors instead of the high-enriched synthetic uranium we are currently using, which poses a proliferation concern. If we were transferring the high-enriched uranium from here in Florida to Idaho and someone got a hold of it, it could be used to create a nuclear weapon. Some people are still looking at Uranium-Silicide, but I don’t think it is as viable of an option. What are the goals of your nuclear fuel research? To contribute to the production of sustainable energy. My nuclear fuels research is concerned with elucidating the behavior of nuclear fuels under irradiation by investigating the formation of fission gas bubbles in Uranium-Molybdenum. The production of these gas bubbles has reportedly induced structural defects that may lead to fuel failure. It is crucial to understand the self-organizational behavior of materials in harsh environments even in fields beyond nuclear engineering. So, the potential of this research isn’t limited to fuel? I want to look at the evolution of materials under radiation. This doesn’t sound mind-blowing but it is very applicable. When looking at the fundamentals of space technology and medicine, those are fields that are heavily impacted by radiation effects. My fuel research will contribute to developing a three-dimensional characterization model of materials irradiation. How did UF help you prepare? I knew a NSF Fellow at UF. She told me about the process and recommended a NSF application class offered by UF. Prior NSF Fellows talked to us about their process. There were lectures that discussed what the reviewers are looking for. We would write drafts and go back and forth to edit with our professor and our peers. Best advice you got during the process that you would pass on? The first paragraph in your opening statement should be the best paragraph. I wrote 12 drafts. It was worth it. How do you think being a NSF Fellow will help your career? NSF is a prestigious fellowship and can help open doors for more opportunities. For me, I hope it will help me make an impact on younger audiences by telling them about my experiences and how I got here. I also hope having the NSF Fellowship will give me more of a voice in the scientific community. How does it feel to be a NSF Fellow? Disbelief. I am still in disbelief. How did you know you wanted to become a Florida Gator? When I came to campus, it was the least stressful visit. There was time to breathe. Then when I met with the faculty, I was drawn to Dr. Assel Aitkaliyeva. She was someone I could look up to – someone who could empower me, so I could build on that empowerment. She also really encouraged me to apply for the NSF Fellowship and was a driver in my completing the application. Coming from a warm region, I also liked the weather here. With more than 12,000 applicants this year, Smith is one of 2,000 recipients nationwide and one of 19 recipients at the University of Florida who has earned this honor. The NSF Fellowship recognizes high-potential, early-career scientists and engineers and provides support for graduate research in STEM fields. NSF Fellows receive three years of research funding over a five-year period and opportunities for professional development.